﻿ Book Napolitano Hotel (Santo Domingo) - 2019 PRICES FROM $119! Across the street from the Caribbean Sea and minutes from the commercial center of Santo Domingo, this hotel offers on-site spa services and a charming restaurant. Napolitano Hotel & Casino offers an outdoor pool surrounded by lounge chairs and umbrellas. The spa offers massage services. The hotel's Terrace Restaurant serves international cuisine. There is also a bar. 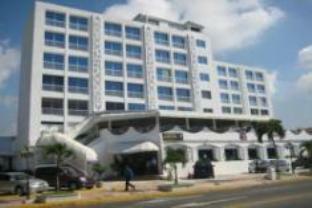 The Napolitano Hotel is located 35 minutes by car from the international airport of Las Americas. The nearest beach is Boca Chica 22 mi away. The staff (especially the maid , very sweet lady)The ocean. An unpleasant surprise. The pool was an over sized heated bathtub. The room monumentally disappointing. The carpets knatty n smelly. Hotel was as expected, except for 2 unpleasant suprises. Except for the fact that only 1 person in the staff spoke enough English to deal with issues. They also didn't respect our aogda payment, so we ended up double charged. the hotel was under renovations and I had to carry my bags through a casino, up 2 flights of stairs to try and find the check in which turned out to be just a guess room. Air conditioning did not work, food was just so so. my wife had an injury on this trip which severely limited her ability to get around. the staff had a wheelchair for her,wheeled her into an upgraded room with beautiful view and made her as comfortable as possible under the circumstances. the staff was friendly and thoughtful and made our stay one to remember. we ran into a problem with hot water for a few days and management compensated by providing a free night on our next stay. i would definitely come back. the breakfast was good. in particular the fruits were great and plentiful. they cooked our eggs to order and were quite good. I have been staying at the hotel many times. I feel that the location is very good. Rooms need to be upgraded. Staff is good. Restaurant is far too noisy.